Global warming is hitting Peru hard: More water stress, more migration, more disease. CARAZ, Peru -- Seventeen years ago, Liliana Salvador Ibáñez's year-old son came down with a high fever, then broke out with bleeding lesions on his legs. Four years later, his brother came down with the same illness, and a few years later a young niece died. All had bartonellosis, also known as Carrion's disease, which is caused by a bacterium transmitted by a sand fly. In this Andean mountain valley in central Peru, mothers observed that there was an outbreak every four years or so. The cycle intrigued Dr. Larry Laughlin, now dean of the school of medicine at the Uniformed Services University of the Health Sciences in Bethesda, Md. Comparing disease statistics with climate data, he found that the outbreaks roughly coincided with El Niño, the warm Pacific Ocean current that brings higher temperatures and rainfall to this part of Peru. Researchers in Lima found a similar correlation with hospital admissions for diarrheal illnesses, especially among children in the shantytowns ringing the sprawling capital. 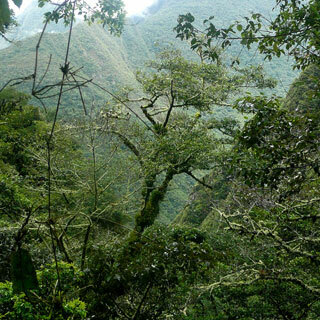 In tropical countries like Peru, health experts are keeping a close eye on climate change. Rising temperatures can change the way diseases behave, while collateral effects -- from the retreat of glaciers that provide vital drinking and irrigation water to more frequent, intense storms and flooding -- increase the burden on developing economies. As diseases like dengue, bartonellosis and malaria spread, pressures mount on already understaffed, underfunded health services. As crops dry up and farmers migrate to urban shantytowns lacking clean water and basic sanitation, the burden is amplified. "If the environmental impacts are unavoidable, the health sector needs to be mobilized so that the health impacts become avoidable," said Dr. Carlos Corvalán, Pan American Health Organization senior adviser on sustainable development and environmental health in Brazil. Carrion's disease, once found in a few valleys, has crept up the mountainsides. The disease, readily cured with antibiotics, must be treated early, as later stages render patients extremely vulnerable to potentially fatal secondary infections. Illnesses like malaria and diarrhea hit children particularly hard and can leave long-term, debilitating effects that extract a high cost from tropical countries. But while it is tempting to conclude that warmer temperatures have created a more hospitable environment for disease vectors like the sand fly, it may simply be that humans have carried the bacillus to a place where it has found more susceptible hosts. "It's really complicated to sort out how much is attributable to climate change," said Dr. Mary Wilson, associate professor of global health and population at the Harvard School of Public Health. Nevertheless, "many infections, including dengue, yellow fever, hanta virus, bartonellosis and leishmaniasis, are very sensitive to climate and to temperature, humidity and rainfall." For the sand flies, the decisive factor was microclimate -- temperature, especially nighttime temperature, and humidity in the cracks in adobe walls where the insects live. Higher temperatures speed up incubation and hatching and increase the longevity of the adult flies. But that does not necessarily mean that a warmer planet will see an uncontrolled explosion of infectious disease, Laughlin said. As the insect population grows, so will the number of predators, he said. And temperatures may eventually rise to a point at which the insect cannot live, changing the geographic patterns of the disease. People change those patterns, too. From beneath the palm trees in Caraz's main plaza there is a postcard view of Mount Huandoy, one of the high points of the Cordillera Blanca. In the Andes, snow-capped mountains are both protective spirits and vital sources of fresh water for crops and villages. Peru has the largest expanse of tropical glaciers in the world, but between 1987 and 1997 they shrank by about 15 percent, a trend that is picking up speed throughout the Andes. In Ecuador's capital, Quito, and the cities of La Paz and El Alto, on the Bolivian Altiplano, millions of people depend on water supplies fed by retreating glaciers. Experts disagree on how soon the water crunch will turn into a water crisis. Nevertheless, Corvalán, the doctor in Brazil, expects the effects to ripple through the health system. "If we're not feeling it now, I'm sure we're going to be feeling it very soon," he said. "This is a problem, because the health issues become very complex." If clean water sources dry up, people re-use water or turn to unsafe sources. They also store water in containers, creating breeding grounds for disease-bearing mosquitoes. And if their crops fail -- because of drought or plant diseases, which also respond to a changing climate -- they may be forced to move to the city. "It's a constant trickle," Corvalán said. "Families migrate, they disappear in the system. It is very difficult to track what is happening to them." In urban shantytowns, people often lack running water or sewer service, and the stress of poverty and unemployment can lead to alcoholism, domestic violence and mental illness, Corvalán said. Those who try their luck in the United States may unwittingly introduce tropical diseases there. In December 2006, the U.S. Food and Drug Administration approved a test to detect Chagas' disease, caused by a tropical parasite that affects the heart, in the U.S. blood supply. Peru's largest cities are on the arid west side of the Andes, and water systems are already insufficient to meet the growing demand spurred by migration. Projects are already in the works to build channels from sources in the sparsely populated but water-rich Amazon basin, while tropical regions are seeing increased migration from the highlands. That will likely increase deforestation, further disrupting the hydrological cycle, which could exacerbate the water crisis. The cycle won't end there. Malaria cases increase with deforestation, researchers have found, while new roads through the rain forest provide corridors for the migration of people, insects and animals that serve as intermediate hosts for pathogens, Wilson said. Amid this web of causes and effects, developing countries must define policies that make the best use of scarce resources. While providing safe drinking water or treating wastewater might seem more pressing, failing to prevent climate-related health problems will also have a cost, Corvalán said. Dr. William Checkley, a disease control and epidemiology specialist at the Johns Hopkins School of Public Health in Baltimore, found that wintertime admissions to the oral rehydration unit at the Children's Health Institute in Lima, the country's largest public children's hospital, doubled during the 1997-1998 El Niño. "It changed winter into summer," he said, allowing the bacteria and parasites to flourish. Checkley estimated that the 6,225 additional cases of diarrhea attributable to El Niño cost $277,000 to treat. The best investment now, Wilson said, would be in setting up regional surveillance networks of climatologists, entomologists and experts in human, animal and even plant diseases. "If you don't have a network in place," she said, "it becomes hard, when there's a crisis, to respond immediately."